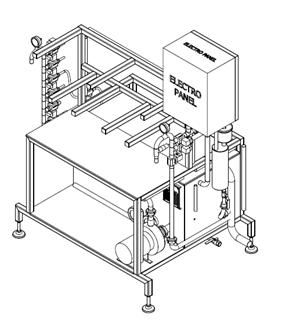 KWF-10 is equipment for manually operated washing and filling of kegs for beer, cider, wine or other beverages. Operation capacity: from 7 to 10 kegs per hour (washing + filling cycles / washing cycles). KWF-10 is full stainless steel (AISI 304) machine designed for cleaning and filling KEGs of volumes 15 up to 50 liters. Machine is equipped with storage tank for sanitation solution, heating spirals, pump and operation panel for controlling temperature and pump. 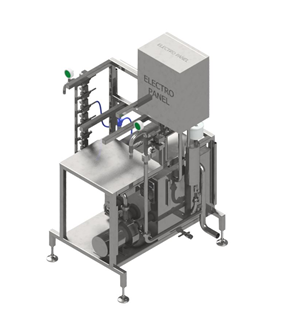 KWF-10 can clean and sanitize 10 x 50 liter KEGs per hour, in combination with filling the performance is 7 x 50 liter KEGs per hour. 8. Filling of the keg with beer. All cycles from 1 - 8 are provided manually by the operator. KWF-30/A is automatically operated washer and filler of KEG´s for beer, cider, wine or other beverages. Performance: from 30 to 50 kegs per hour (washing or filling), 20 kegs per hour (washing and filling together). KWF-30/A is full stainless steel (AISI 304) machine designed for cleaning and filling KEGs of volumes 15, 30 and 50 liters. Machine is equipped with storage tank for sanitation solution, heating spirals, pump and operation PLC panel. All cycles from 1 - 8 are provided automatically.